MATTHEW VASSAR, VASSAR FEMALE COLLEGE. Established 1861, Poughkeepsie, NY, U.S.A.
THOMAS HOLLOWAY, ROYAL HOLLOWAY COLLEGE . Established 1886, Egham, Surrey, England. I first became aware of the strong links between Royal Holloway College and Vassar College in the early 1980s when I received a communication from the late Professor Caroline Bingham, who was then researching and writing the history of Royal Holloway College in anticipation of the celebration of its 100th anniversary in 1986. It so happened that I was contemplating a trip to England shortly thereafter, and we agreed to meet in London. We spent a long afternoon over a pub luncheon piecing together the connections between Vassar College and Royal Holloway College, which were startlingly interesting. Thereafter we corresponded about details, and when Bingham's book was published, she presented me and the Vassar Library Archives with copies. I took up my interest in Royal Holloway again when my son resided for a time in Virginia Water, just a short distance from Egham and Royal Holloway (now Royal Holloway and Bedford New College, having merged with Bedford College in 1985.) Thomas Holloway modeled his imposing building on the French Chateau of Chambord, which he admired as he traveled about France, just as Matthew Vassar earlier in 1845 after a trip to England and the continent, had conceived of building a memorial to the Vassar family in America modeled on the French Tuileries and other French Second Empire Buildings. The fame of Vassar College spread far and wide in the mid-to-late nineteenth century. Articles were written in several languages about Matthew Vassar's venture; foreigners visiting America included a trip to Poughkeepsie on their itinerary; essayists and philosophers, even a king, came to scrutinize Matthew Vassar's college and deliver , for the most part, approving judgments about it. One such visitor was George Martin, an Englishman traveling in America in 1875 on behalf of the business interests of his father-in-law Thomas Holloway, proprietor of Holloway's Pills and Holloway's Ointment, "The Holloway System of Medicine." 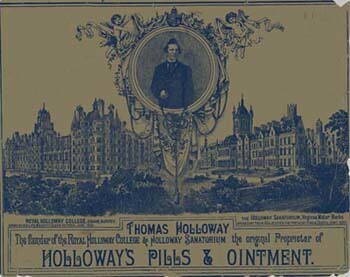 The patent medicines of Thomas Holloway had earned him a large fortune in London, comparable to that which Matthew Vassar had derived from brewing beer and ale in Poughkeepsie. The concatenation of events between the careers and aspirations of Vassar and Holloway is especially striking considering that the two men never had a personal encounter, as Matthew Vassar died in 1868, three years after Vassar College was opened, while Holloway lived until 1883, three years before his college was opened. George Martin and Matthew Vassar Jr., the Founder's nephew, apparently enjoyed a few hours together on the Vassar campus early in 1875, when Martin came to inspect Vassar College on behalf of Holloway, Martin's objective was to brief his father-in-law with. his full impressions of Vassar as Holloway already had made up his mind to found a college for women in England. In a subsequent anonymous article, the author, presumably Martin, according to Bingham in our interview, spoke of touring Main Building, then referred to as The College, with its library, chapel, art gallery, and dining room, where he encountered the students at lunch. He visited the former Calisthenium and Riding Academy, built in 1866, newly called The Museum, which had just been remodeled, to provide space for the display of Vassar's plaster cast collection and scientific cabinets as the college grew. Martin also met with the president of the college, John Raymond, who recommended that Holloway should assemble a painting collection similar to the collection of paintings of the Hudson River School purchased by Matthew Vassar in 1864 from the Rev. Elias Magoon, an art collector as well as a Vassar trustee, a collection which served as the nexus of the college's art collection. Vassar's continuously expanding art collection moved again in 1914 from the Museum to the newly built Taylor Hall gallery, and then in 1993, to the new space of the Frances Lehman Loeb Art Center. When Holloway heard from Martin of Vassar's collection, he decided that his college should have such a collection also. As described by Bingham, with the help of a young artist, Charles Carey, Holloway began to collect paintings of 19th century English painters sold at Christie's auction gallery in London in the early 1880s. That Royal Holloway collection is currently intact in the gallery in the college building. Many other analogies characterized the respective approaches of the two founders to the challenges, unfamiliar to each, of founding a college. Both men broke previous plans to build hospitals, in Holloway's case a hospital for the mentally ill, in Vassar's, a general regional hospital to be developed with his nephews --a reflection of his ancestor Sir Thomas Guy's accomplishment in building Guy's Hospital in Chelsea , London three quarters of a century earlier. Holloway's wife Jane prompted him to build a college for women, according to Bingham. Similarly, Lydia Booth, Vassar's niece, an early 19th century school-teacher with feminist leanings, urged him to use his money to found a college that would be for women what a Yale or a Harvard was for men. "It occurred to me," Vassar said in his first Communication to the Trustees, Feb.26, 1861," that woman, having received from her Creator the same intellectual constitution as man, has the same right as man to intellectual culture and development." Both men desired massive, impressive buildings for their enterprises, buildings that would reinforce their reputation as benefactors and display their family names for posterity. 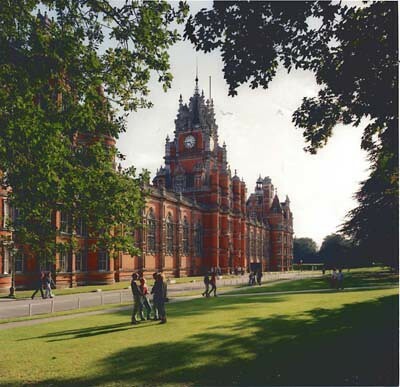 Both founders were concerned about the environments in which their colleges might thrive, the site for Royal Holloway was chosen because of its "situation" of "great healthfulness and beauty" and "good fresh air." 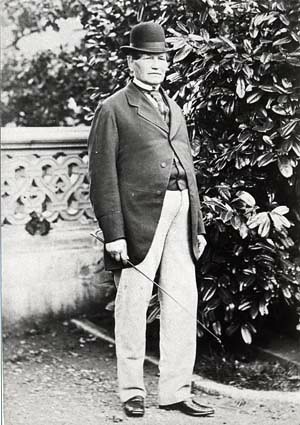 Milo P. Jewett, Vassar's first president, counseled Matthew Vassar and Matthew Vassar Jr. with a similar concern for an environmentally favorable location: they looked up and down the banks of the Hudson River, but after all, chose the site of the Davies Farm, which in the eighteenth century, according to Benson Lossing, Vassar's biographer, had been the county fair grounds. Lossing wrote: "More desirable than anything else for the health and comfort of the inmates of the projected college was a large pond of pure spring water on the grounds, where fountains had never failed in their abundance, and whose outlet, that had for years turned a mill wheel, presented an assurance that an all-bountiful supply would be given." Like the aging Matthew Vassar, the aging Thomas Holloway took on the responsibility for planning his institution. He gathered together well-known British scholars and politicians to offer him advice, just as Matthew Vassar had sounded out prominent American educators, college presidents, artists, businessmen, and editors as he was priming himself. The nineteenth-century arguments advanced against founding a college for women were the same in England and the United States. Theories and fears were advanced on both fronts about the dangers of decreasing attributes of femininity and "making mother less maternal." Each founder recognized that his scheme was against the grain of a medical and cultural climate in which many feared that women's reproductive systems would be impaired by intellectual labor and that their studies would inevitably lead to the "decline of the species." In sum, both Matthew Vassar and Thomas Holloway, each self-made men who amassed enormous fortunes, built monuments which would serve mankind (womankind), bring honor to their family names, and perhaps soften their earlier reputations as brewer and medicine-man. The Baptists did not really like him according to the late Poughkeepsie city historian Elizabeth Carter in an interview, perhaps because he sold beer and ale, but perhaps even more because he threatened to foreclose on a mortgage on the First Baptist Church. Bingham, Caroline. The History of Royal Holloway College. London: Constable and Co, Ltd, 1987. 48-53. "A Visit to Vassar College" by "A Business Man Out of Harness" in The Queen, July, 1875.